Thanks to mad3001 and overCLK, we've now been able to reprogram the Dandanator CPLD using only an arduino nano (€2.0 aprox.) hardware. We've used a lot of info and resources from different Internet pages in the process, and adapted them a bit. In the following days/weeks, we'll be integrating this upgrade into the Romset Generator, so you would just need to plugin your Arduino nano, connect it to the CPC Dandanator Board and press a button. Then your cartridge CPLD will be upgraded. YES thats what I call SUPPORT/SERVICE. It takes a while from china. Excellent, it takes courage and character to own that there is a bug! That one is ok. An arduino Uno will also work. 1) make sure it has a bootloader already installed from factory. Otherwise you will have a hard time programming the arduino itself. The ones I bought clearly state that. Do you have a link to the one you purchased Please. These are the ones I've bought. They haven't arrived yet though, so I can't be sure the seller's claim about the bootloader is true. And this is one option for Dupont cables. Choose the whole lot (M-M, M-F, F-F) so you are served. Well, all java code is ready and tested. In one button press, the Arduino gets programmed and the Dandanator updated. Nothing else to do but plug the arduino to the PC and to the Dandanator. overCLK is integrating the code into the main Romset creator and I'll also write an step-by-step manual for Nano and Uno, including purchase links for arduinos. And this is how it looks. Just press "Programar"
The other 8 people (9 CPC Dandanators) will receive the cartridge with the correct JED loaded. So you guys just forget all this . Since this is MY FAULT and mine only, and you are too far away for getting together in a retro event, I'm willing to pay for the arduinos nano you need to correct it. So, for those of you in the first list, just drop me a PM with your PayPal account and I'll send you 2€ for the Nano. I'm sorry for the hassle, but I believe we are making the upgrade process quite painless. I hope the manual will be online by the end of January. NO Payment required, Thanks anyway. As my primary use of the Dandanator will be with a 6128+ (Parados on cartridge) I don't anticipate that this will be a problem. And thanks - for the product support. And overCLK shared a video of the updated process. He is using a patched 1.2 dandanator board to become a 1.3 so don't mind the PCB mods. One question please: If I press the button, and the Dandanator is off, I do see the usual sign-on message, yellow on blue. Like usual. But... the AMSDOS is not there. How can I get Amsdos back? This is actually the bug we are trying to correct with the arduino update. ... and I'll also write an step-by-step manual for Nano and Uno, including purchase links for arduinos. Thank's that's a great idea! Probably there is no way to perform the update using the CPC?? CPLD reprogramming using Arduino Uno or Arduino nano. No messing around, connect cables and press one button. Romset transfer speed upgraded up to 115.200bps. Previously a romset took 2:42 to be transferred, now just 1:49. Option to force compatibility of 464 games with 6128/664 Amstrad CPCs. Now you can play oh-mummy in your 6128, or any SNA/CDT for 464. Vastly improved CDT load. Not perfect yet, but we're still at it. New emergency tool to recover a corrupt or new flash memory. You can type a code of 39 datas, launch an audio from the PC, create a CDT or a DSK. Imported 6128 games of 64k size are now allowed to be launched from a 464 or 664. Some improvements in DSK import. We will continue to look into this. Change the logo screen by importing a RGAS image or a Multipaint dump. Many many internal improvements and preparations for new features to come. you can get the new romset creator at the project webpage, look at the end of the downloads section. 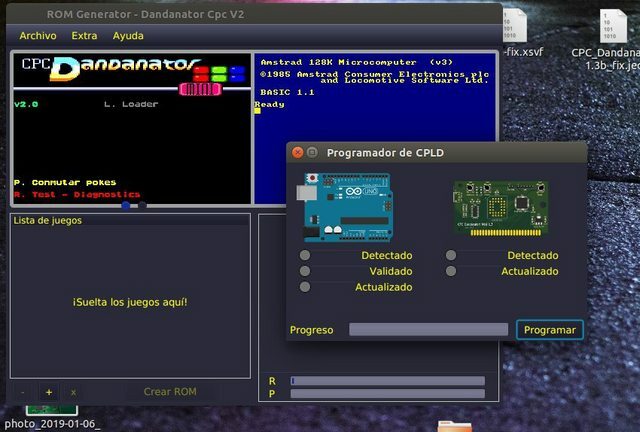 mad3001 has produced a set of videos with step by step English instructions to disassemble, update CPLD and reassemble the CPC Dandanator. A lot of units have already been updated using arduinos. Any feedback from the users of this forum? Mine was successfully programmed with a Nano. corrected arduino model. Nano instead of Uno. The NANO arrived today, (BUT). NO But, it programmed the Dandanator. This is as far as I get ?? The Detected light just flashes. ?? AND IF RAY WAITS FOR 1 MINUTE it then goes and programs the Dandanator . Sorry for the garbled messages above. The first Dandanator that was updated Took about a Minute to go from Detected to Validated, and then straight to Programmed. The second Dandanator took about 2 Seconds to go from Detected to Validated and then straight to Programmed. Thanks Now are both Updated. The culprit of the delay is the mess around Arduino bootloaders... there are tons of variations with different speeds and conditions. Instead of making you guys use a tool to program the Arduino, we implemented a kind of jack-of-all-trades stk protocol (the boot loader protocol) and tuned it here and there. Of course it's not optimised, so with certain bootloaders or hw configurations, it may take a while to detect the Arduino. In your specific case, the first dandanator took a bit more because we only program the Arduino if it is not already programmed with the CPLD software, so your Arduino was only flashed once, the first time. It was the first time I have used a NANO so was sure of what was to happen (The Video was fine). Please thank all the people who got this flasher up and running. Page created in 0.493 seconds with 106 queries.